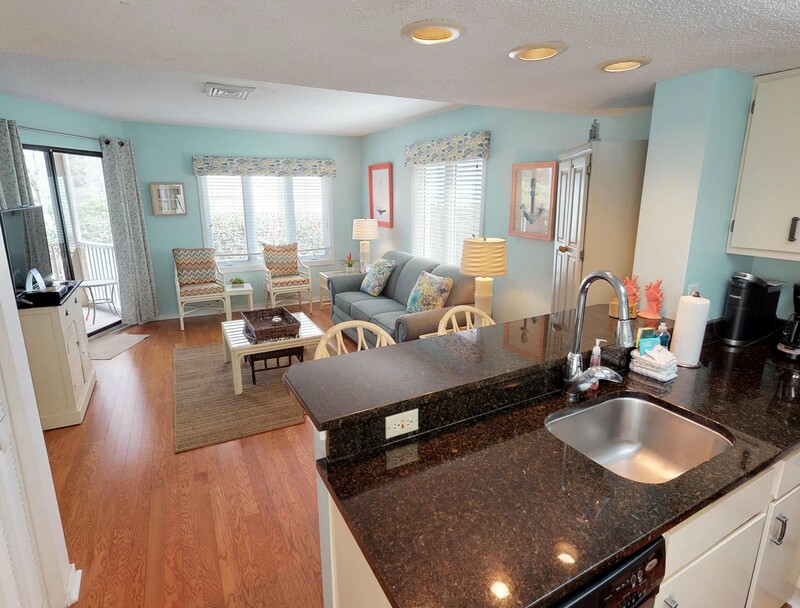 Beautifully decorated one bedroom corner condo in Wild Dunes! 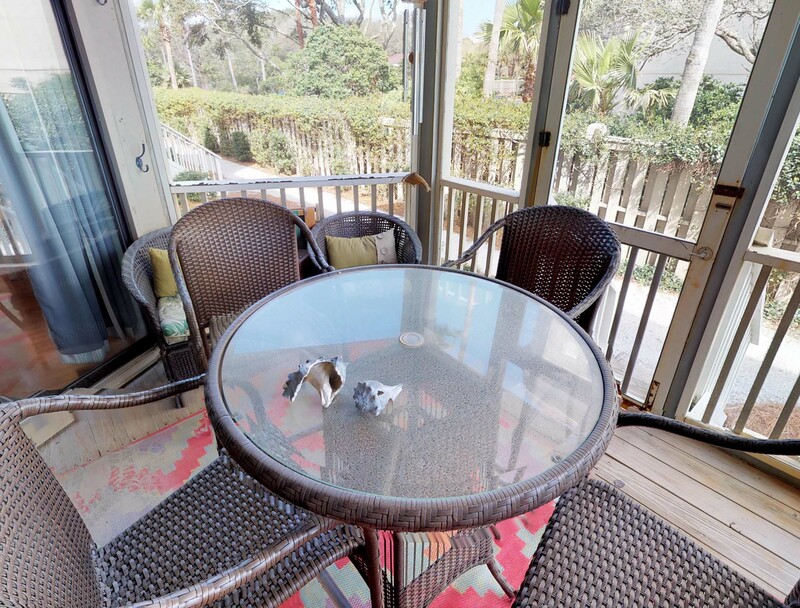 Views of the ocean from private screened porch! 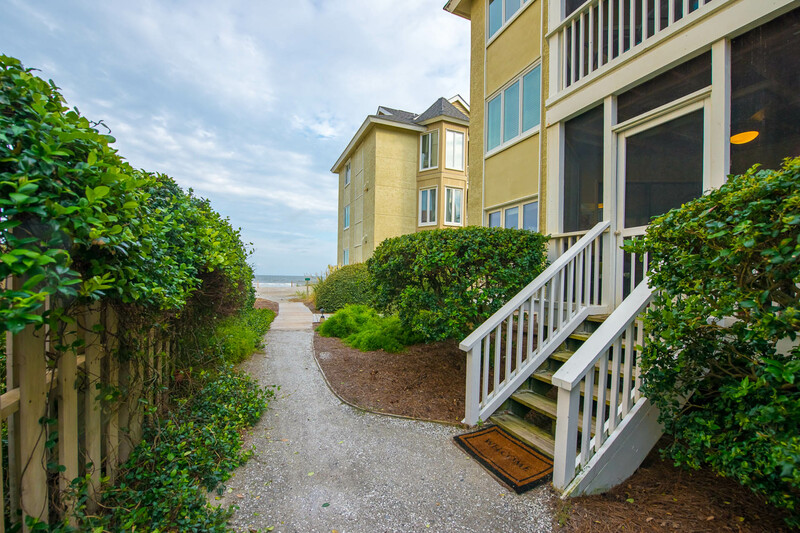 Step directly from the porch to beach access walk-way! 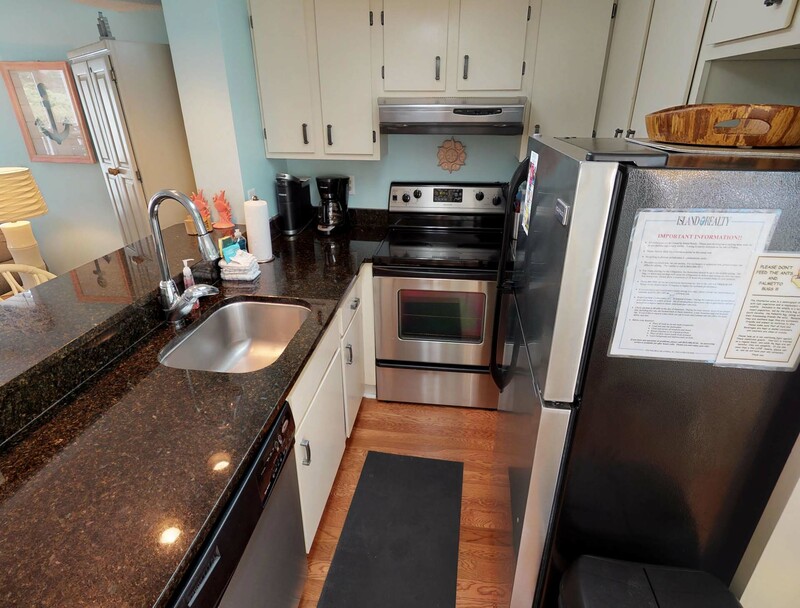 The condo includes a fully equipped kitchen offers crisp, white cabinetry and stainless steel appliances. Seating for four in the dining areas with two additional bar stools at the counter. 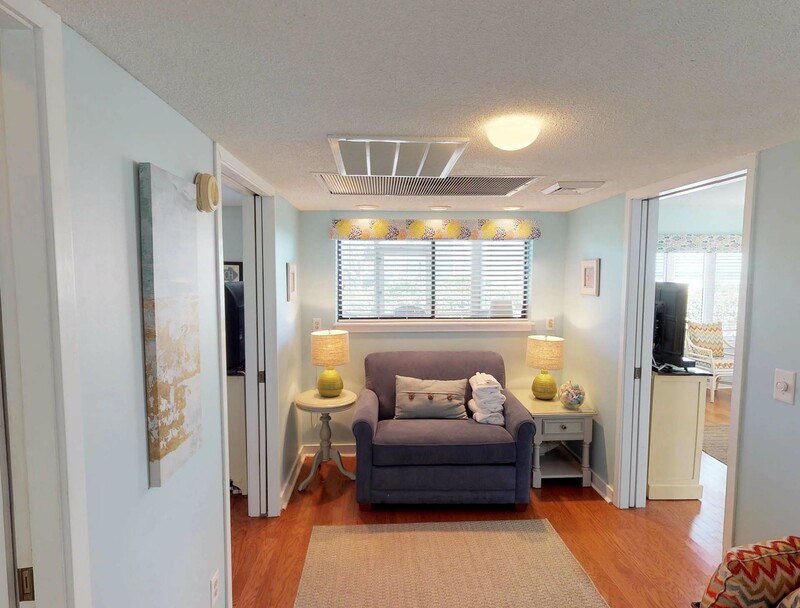 The living rooms offers comfortable furnishings with a Queen sleeper sofa, a flat screen TV with DVD player, Netflix, a Wii gaming system, and access to porch. 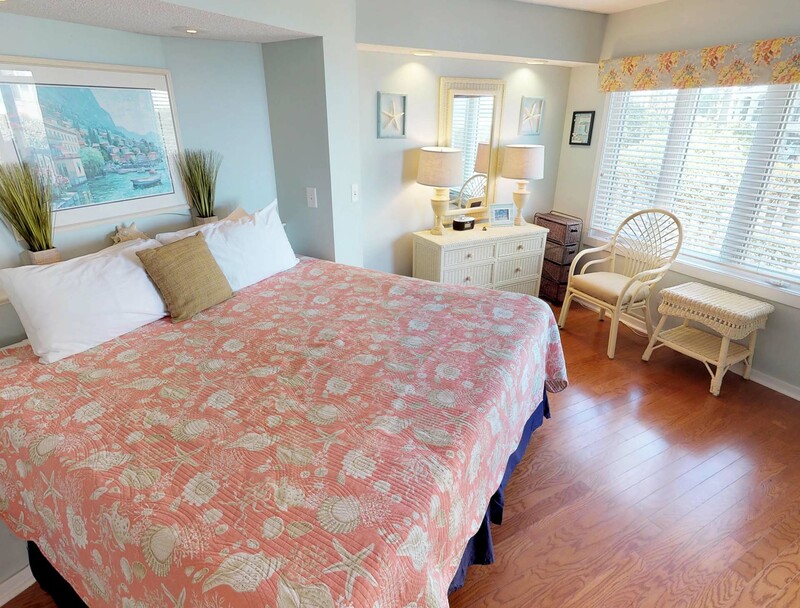 The master offers a King size bed, flat screen TV with DVD player & Netflix, and access to porch. There is an additional Twin sleeper sofa in the foyer. 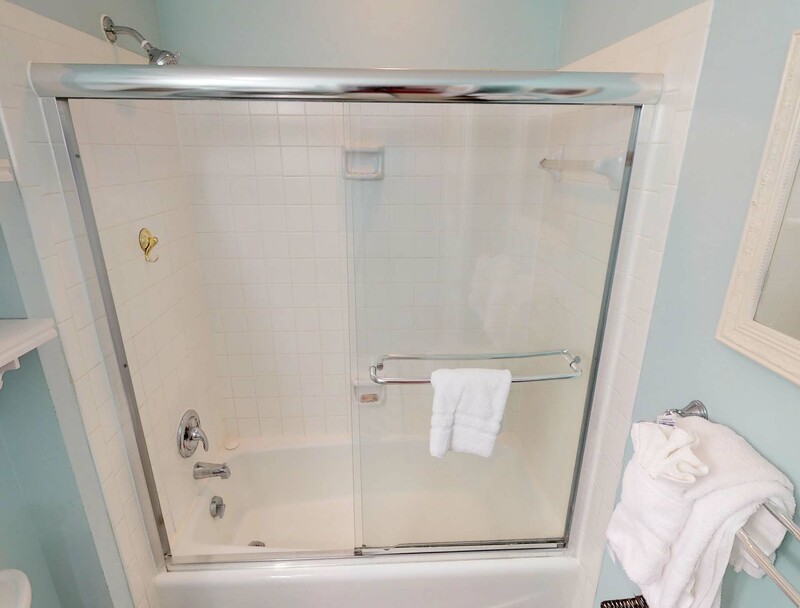 The updated bath includes a tub/shower combo. 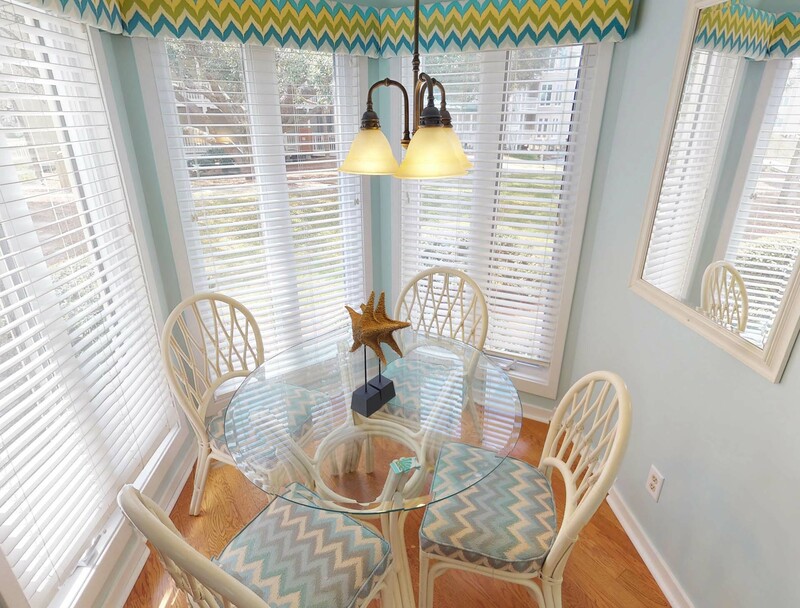 At G101 you will find crisp, clean décor with lovely accents and pops of coastal colors throughout! Access to complex pool. WiFi. LIinens. No Smoking. No Pets. Entrance hall with writing desk. Dining: Table for 4 with 2 extra barstools at the kitchen bar. Patio with dining for 4 people / access to the community pool. 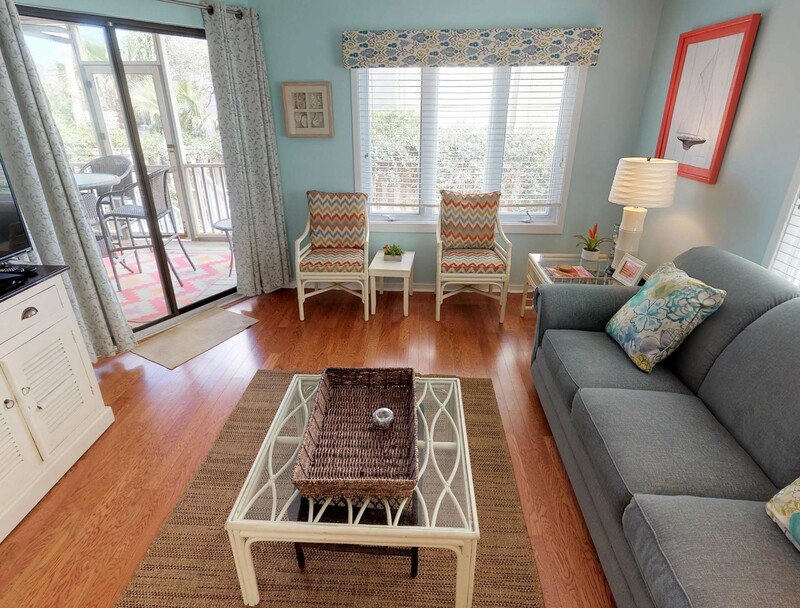 Port O Call G101 is a wonderful condo located very close to the ocean. This is a wonderful property with great views and access to the beach. I will be staying here again. Thank you for taking the time to leave a review. We look forward to have you stay with us again soon and please do not hesitate to reach out to us during your next vacation. This condo was clean, comfortable and cozy. Perfect for our vacation. We enjoyed the screened room every morning and night. Great location, almost ocean front and steps from beach. Condo not as great. Maintenance issues with shower and sliding door that housekeeping should have seen if they had really cleaned. No place w/enough light to read a book. TVs are on some strange system, difficult to operate and very limited channels, especially limited sports channels. And no corkscrew to open our wine--should be a required item! Beautiful view and comfortable accommodations. 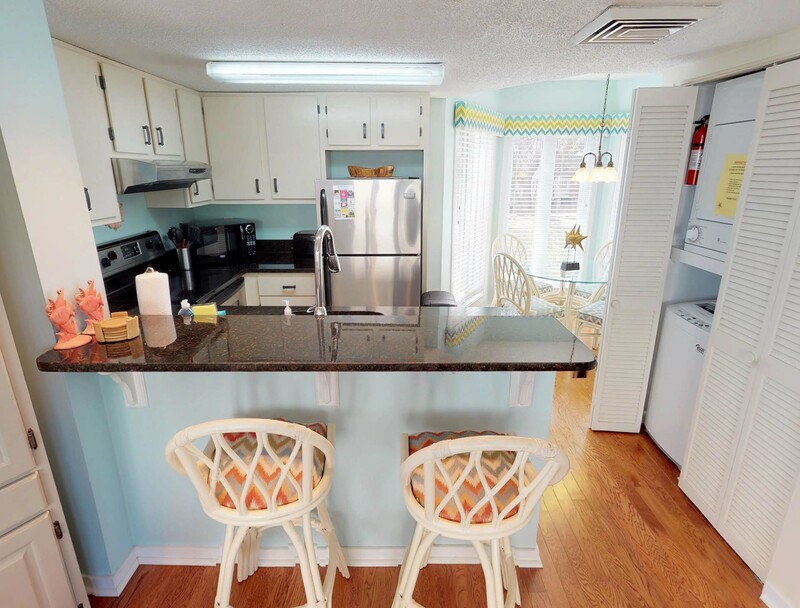 Loved this unit and the access to the beach. It was very comfortable and the perfect size for our family of 3. I do wish it were closer to restaurants. Island Realty made our stay easy and hassle free. The home has a beautiful view and is nicely decorated. Previous comments stated the king bed was uncomfortable, but we slept well on it!! It could have been cleaner. It was not dusted and the bathroom floor had hair on it. Other than that we recommend staying here. Great vacation at wild dunes! Great vacation! Property was very clean and the kitchen had everything you could want to cook a full meal. Only problem with unit was the bed. They had a pillow top that should be thrown away. Would love to stay again if bed was replaced. Island Realty came out and resolved problem with air conditioner within the hour. Wonderful time. Check in is easy. 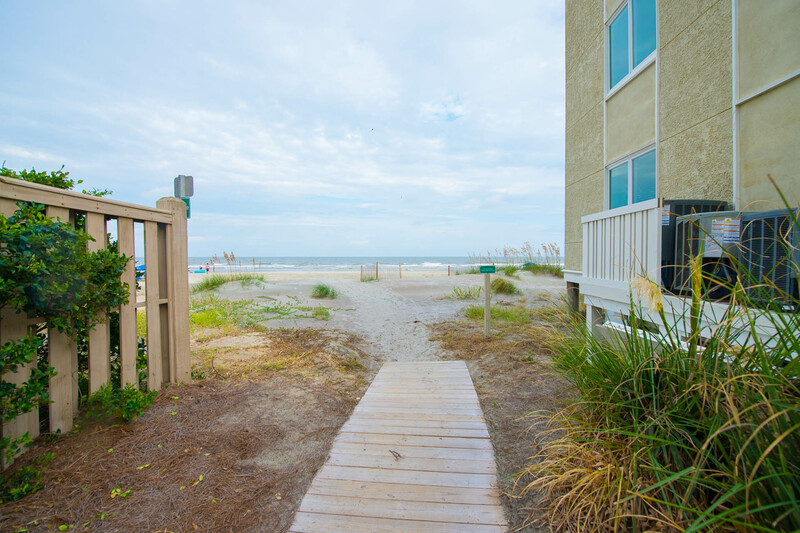 Access to the condo is easy. The location is outstanding and the condo itself is nicely furnished. This is a well appointed and cozy beachfront condo. It is has a very relaxing feeling. The only downside would be the 's not the most comfortable but I would still stay here again. We loved our rental unit and are excited to come back. The only improvements we'd suggest are having some basics such as salt, pepper, olive oil, laundry detergent, on hand. We were only staying for 3 nights and didn't think to buy those staples. My husband, 1 year old, and I had a great time here! We were seconds to the beach and really enjoyed being able to see the ocean from many areas in the rental. The owner had just updated a lot of the furniture the day before we arrived, both inside and out on the porch, which was very nice! Everything worked well, and the rental was very clean when we arrived. We loved being so close to the ocean and to a pool. We also used the community grill twice, which worked great. The only downside (and this is us being very picky) were the sheets on the master king bed. Because the owner has a waffle topper on top of a very thick mattress, the sheets wouldn't stay on at all. Overall though, we had an amazing time and would definitely come back! Very nice location. Enjoyed being just steps away from the beach and having screened in porch to sit and watch the ocean. Condo was not very clean on arrival. Furniture needs updated especially bed in bedroom. Very old mattress and tried to fix with very thick foam topper. Also need place to clean sand off before coming into condo. We will return to port o call but will try another condo that is more updated. G101 not very nice for the price we had to pay. Island Realty did a wonderful job from start to finish. Drew made the check in easy and he was available for any questions throughout the stay - so kind. I spent the evening with a book on the porch looking at the ocean. You can see and hear the ocean from almost every room. Keep your food in the frig - this is the beach and there are palmetto bugs even though every location sprays. Ask how to use the tv, there are multiple remotes. Housekeeping is spectacular. I have stayed at Wild Dunes for many years and Island Realty and this location is by far my favorite. Overall we were satisfied with the rental, but because this unit had just changed owners we had a problem with the TV, internet, and WIFI. This was corrected within a few days. The kitchen was well stocked, but small. Plenty of storage space throughout for 2 people. Great view and location. the only thing that was a problem was wasn't able to check in on time because there was a problem with the washer. after a two hour wait we arrived there was a mildew spell coming from the area where the washer is and when my husband checked it out there was still water in the washer machine. we called maint. and they came the next morning trying to get the water to cycle which it would not do. also the ref. would not cool and he also checked that other than seeing 3 rouches, everything else was fine. We have nothing but good things to say about this rental. The condo was sparkling clean when we walked in the door. The very short walk to the beach was awesome. The pool was refreshing and we enjoyed many hours in it. The restaurants nearby we're wonderful and the short trip to Charleston was great. We would definitely book in Port O Call again! love being so close to the beach!! Unit needs a new master bed. We had a little problem with the pull out couch but got it to work. Got locked out because the keyless entry needed new batteries but they were there in less than 10 minutes to fix it! The bushes need to be trimmed to get that awesome view! All in all a great place, so close to the beach, pool very nice, stocked with everything you need - would stay again in a heartbeat! 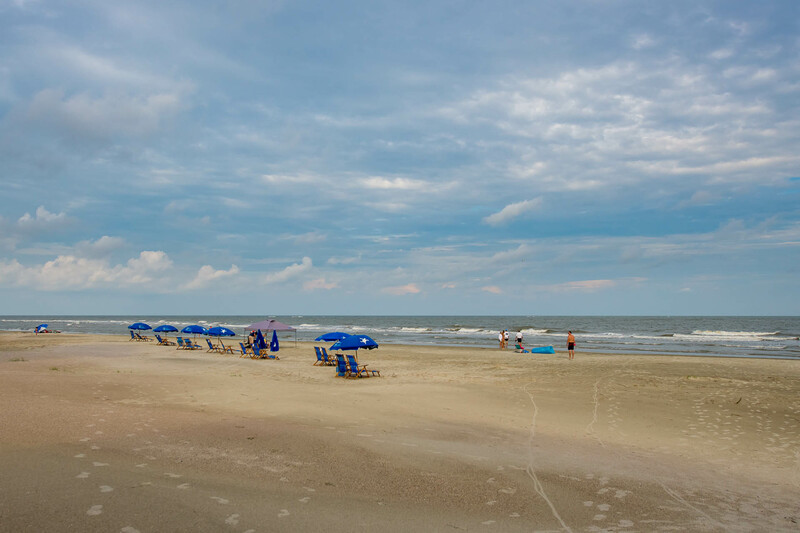 My wife and I needed a mini vacation and we knew exactly where to come...the Isle of Palms. We weren't sure if we could find a short term rental but did and it was fabulous! Very clean, very comfortable, and very relaxing. Pool was nice and easy access to the beach. Excellent beach rental. 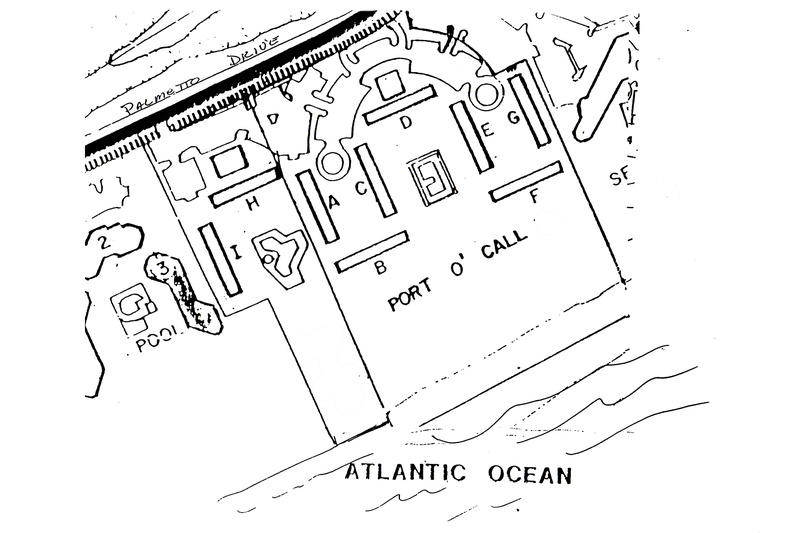 We have stayed at Port O Call twice, both times the stay was quiet and restful. The pool is very well maintained. The neighbors were very quiet and respectful of the privacy of others. One maintenance item should be considered, the hedges between the back porch and the beach is overgrown and it blocked the view for which we payed. Location was great and so convenient for us with small children. Layout worked well for families. This unit was well-equipped, clean, convenient and just right for us! We will request this unit again if it is available. Port of Call G101 - Excellent!!! You can see and hear the ocean right from your bedroom. It was such a nice and peacefull place. Not a lot of noise. Perfect place for a couple!! Will stay here again!! We needed a place to relax from stress of life. This sure was the place. Very quiet and peaceful to watch the ocean from the nice porch and lovely living space. The bed was very comfortable. All the areas were nice and clean. Easy walk to ocean too. 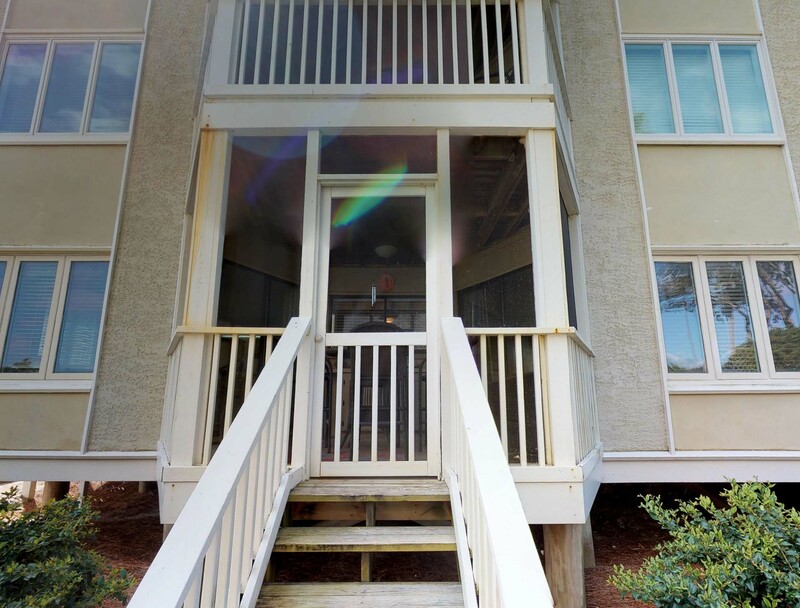 This property was in a great location, however the interior of the condo definitely needs updating. 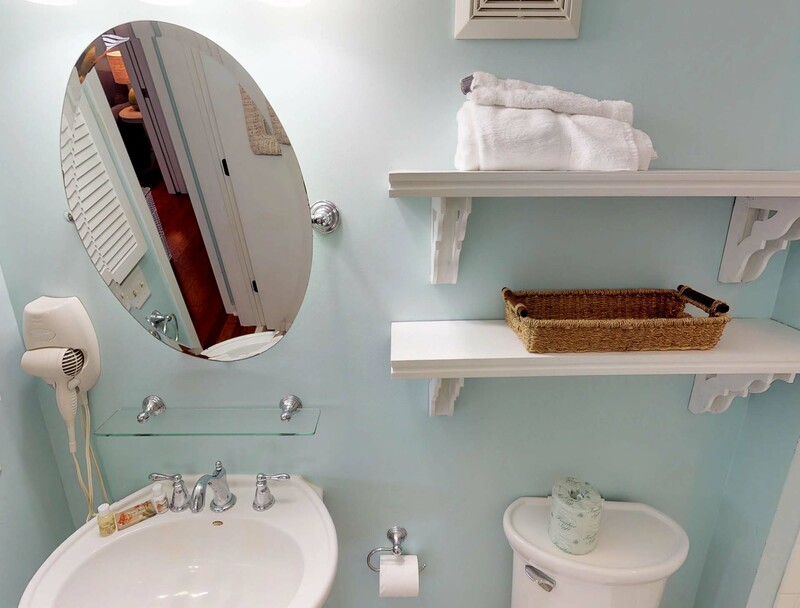 The bathroom was terrible, no storage space, no shelves in medicine cabinet, toilet seat old. The furniture was old and outdated and just plan drab. Not beachy at all. Sleeper sofas unconfortable. It says sleeps 6 people, impossible. I felt cramped with the bathroom. The owners need to update the furniture and gut and redo bathroom. A great little place to stay for a couple or small family. 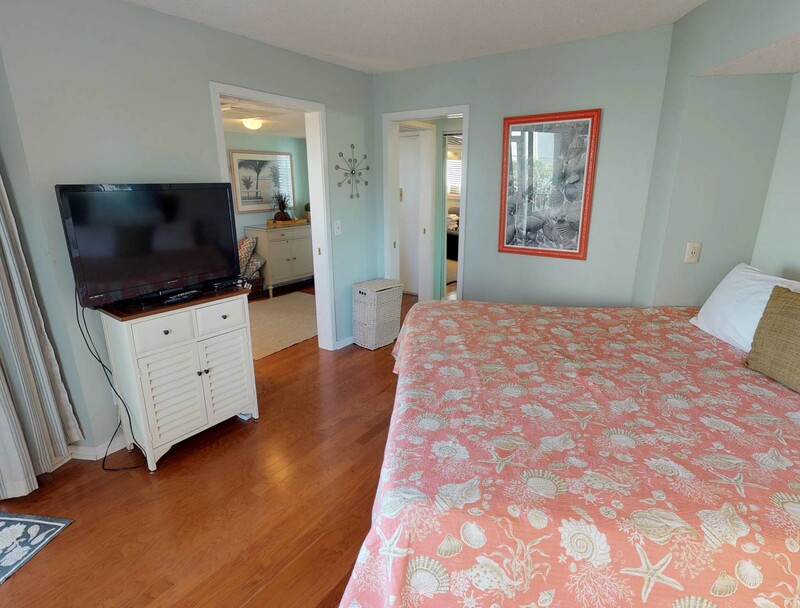 This one bedroom unit has a lovely ocean view just steps from the beach. Ideal small condo for couple or family with small children. It is nicely updated in the kitchen and bath. Decor is light and nice. Lots of thought went into where you need storage,surfaces for suitcases,etc. We were dong some renovations on our rental in the area during the day and your place was just perfect to come back to after a long day of work. The place a had serene atmosphere , the kitchen was stocked well for our cooking needs, the beach was just two minutes away . It was perfect for our needs. We would come back again. Great place , great location. Great little spot for a quiet get away. So glad you enjoyed it! Thank you for choosing Island Realty! We hope to see you again in the future! The condo was cozy and we enjoyed the ocean breeze on the porch while having morning coffee. 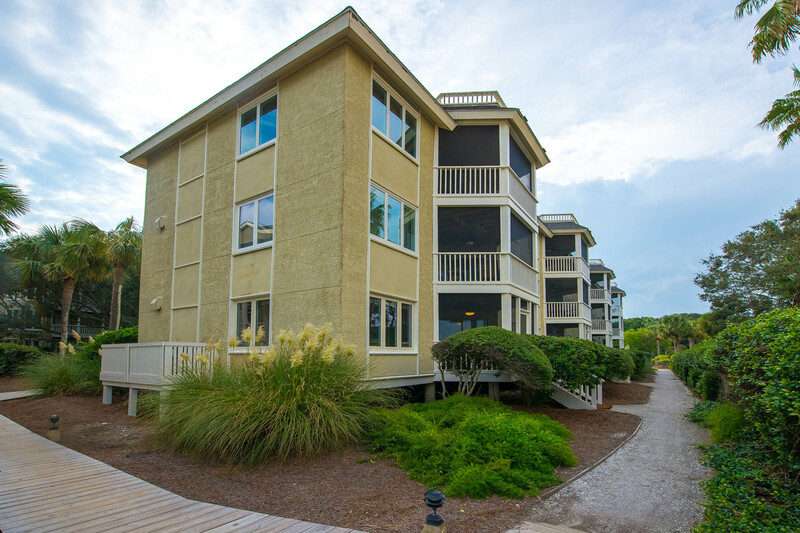 The condo is conveniently located to Charleston. Wonderful experience....Loved the location and how quiet it was!!! So glad you enjoyed it! We certainly hope you come back for another visit! The condo was very clean and up to date. We had everything we needed. The beach chairs and umbrella were great! 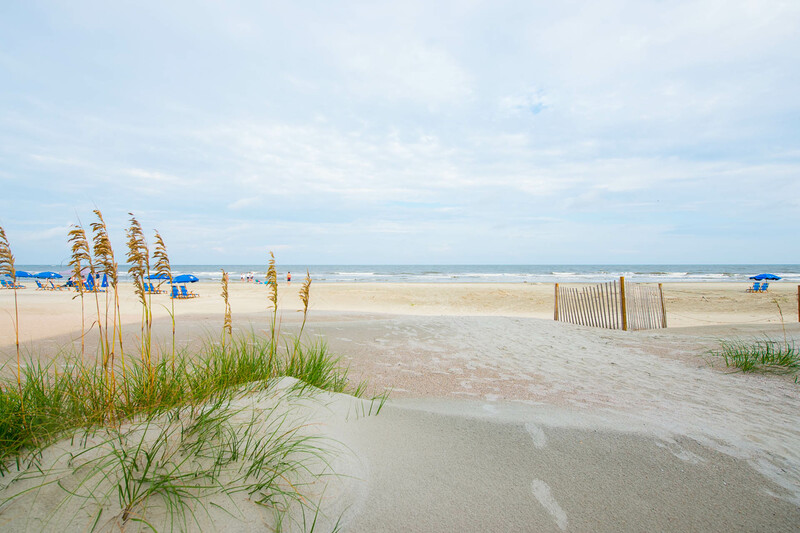 The access to the beach was great, just step outside the porch. It would be nice if the schrubs were a litle shorter in front of the porch, so you could see the ocean sitting down. But no big deal!! We loved it and will come again. This was our 3rd time at Port O Call. We also stayed at Tidewater once. This place was nice but rather drab. The brown and black decorating needs some color. It's depressing. Also the sofa needs replacing. It is very uncomfortable. We could see some nice updates to the unit. Otherwise we enjoyed our stay.